The BC Wildfire Service employs approximately 1,600 seasonal personnel each year, including firefighters, dispatchers, and other seasonal positions. Be a good neighbour. Be FireSmart. Simple steps can reduce the impact of wildfire on your property. Find the latest information on wildfires that are particularly visible or pose a threat to public safety. View the location and details of all active wildfires in B.C., as well as Fire Centre boundaries. B.C.’s hub for disaster information, from evacuation alerts and orders to response and recovery resources. 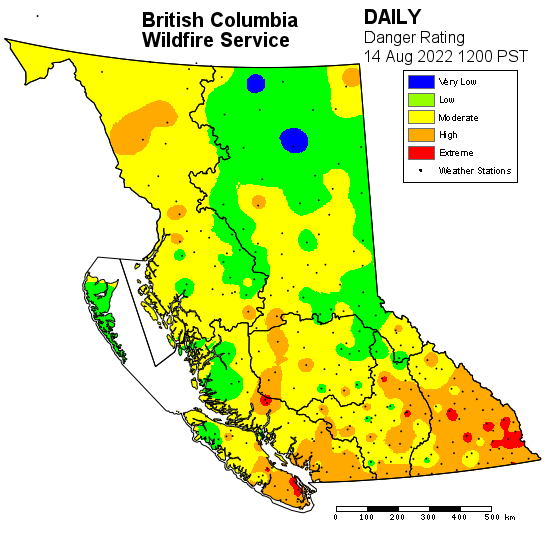 Get information on current wildfire activity in B.C., including details about specific wildfires, fire response efforts, and Fire Danger Ratings across the province. We’re in this together. Wildfire prevention can happen at home, in the backcountry, and through larger-scale fire and fuel management planning. Learn what you can do to help. Industry and commercial operators in British Columbia have, under the Wildfire Act and Wildfire Regulation, legal obligations and responsibilities with respect to fire use, prevention, control, and rehabilitation. Apply for a position with the BC Wildfire Service, or get information on how to offer your services to the BC Wildfire Service as a contractor. Find out how the BC Wildfire Service manages wildfires, learn about the history and governance behind the organization, and get statistics and geospatial data from previous fire seasons. Fire danger ratings indicate how easily fires can start and spread in an area.